I Remember and Extol that Grace which flows from the Supreme Bliss manifestation of Madhava. In Kaliyuga, Madhava (Lord Krishna) doesn’t come Himself to enable the SAPs, He need not come, as he has some great devotees, divine Jeevatmas, who are ready to take forward the task(s) of the Lord and the Lord enables them to enable others. That is what has happened with our Voice of SAP team in Dev Bhoomi Dwarka District. 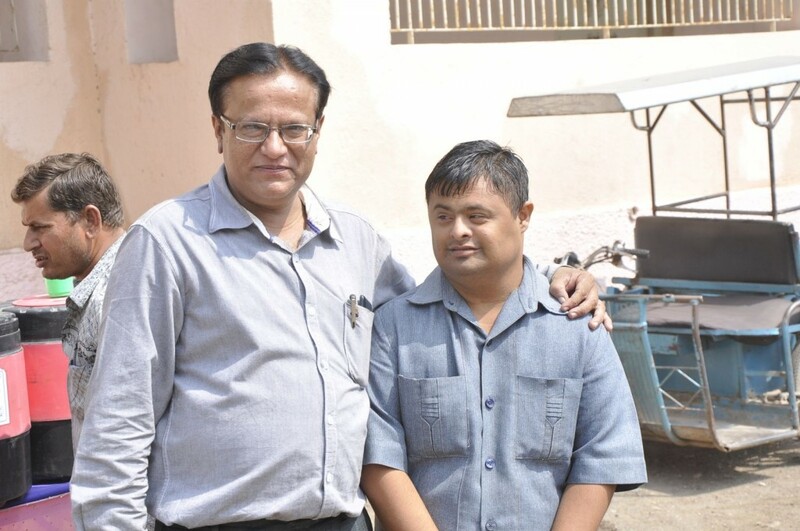 Driven by 36 points “Sankalp Patra” agenda items (VoSAP District Development Template), Shri Chandrashekhar Buddhbhatti, VoSAP’s regional volunteer leader is leading the efforts for the real Empowerment of the Specially Abled People. 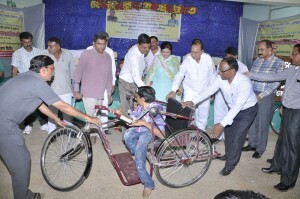 On 17th October, 2015 Dev Bhoomi Dwarka’s collector office (Co-signatory to VoSAP “Sankalp Patra”) along with VoSAP team, Member of Parliament (Poonamben Madam) and other organizations such as ALIMCO distributed Assistive Devices to Prosthetics, Visually Impaired people, Hearing Impaired and other physically challenged SAPs. 142 SAPs received Assistive Devices at Free of Cost with great efforts from VoSAP’s Dev Bhoomi Dwarka Team. The programme was chaired by Hon. Minister in charge of Dev Bhoomi Dwarka District Shri Babubhai Bokhiria. Hon. Member of Parliament Smt. Poonamben Madam was the chief guest and several other regional political leaders were present. With the great cooperation from the MP of Jamnagar & Dev Bhoomi Dwarka District, Smt.Poonamben Madam and the District collector Shri H.K.Patel (IAS), this successful program became the cause of the real Empowerment of the Specially Abled People. Shri M.A.Pandya (IAS), DDO, Dev Bhoomi Dwarka Dist. was always available to our team for any help needed to make this programme a great success. 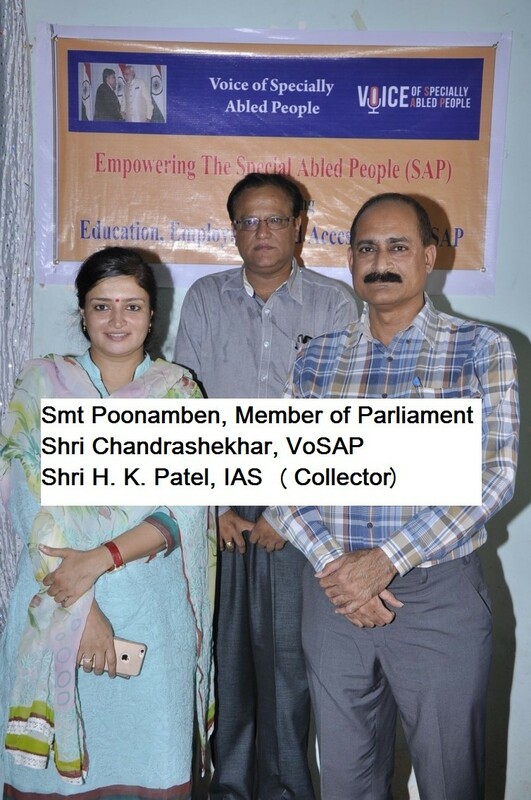 VoSAP is striving towards building teams at every district of India with such a devoted MP like Smt. Poonamben Madam, truly “accessible” District Collector Shri H.K.Patel and highly proactive VoSAP volunteer leader like Shri Chandrashekhar Buddhbhatti, so the whole of India will get transformed into Accessible India, SAPs will get Independence and Empowerment and Bharat Mata becomes a proud mother for her 70 million Specially Abled People.